Wheaton works with only the finest moving supplies and packing materials, giving you added security in the knowledge that you’ve hired the best movers with the best tools. 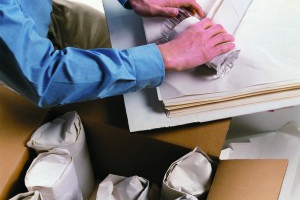 In addition to typical small, medium and large boxes,Wheaton agents also offer a variety of materials for purchase should you choose to pack yourself. A little time, thought and investment in quality supplies can make a big difference when it comes to protecting your belongings. Dishpack – Designed with internal dividers to accommodate fragile items, such as dishware and glassware. Wardrobe – Allows clothes to hang on a metal bar. Mattress – Protects mattresses from damage and soiling. Mirror – Designed to adjust to different sized mirrors, pictures and other fragile, flat items. Newsprint – Provides a clean, protective surface for almost all your wrapping needs because it does not contain ink like newspaper, which can soil or damage your belongings. Bubble pack – Offers greater cushioning and protection for extra fragile items. Choose a high-quality 1½” to 2″ wide tape. For added protection, plastic PVC-type tape or strapping tape with filament strands are the best options. Securely closes containers for shipping. Select a heavy permanent marker. List the main items in each container. Indicate which rooms boxes are to be placed in upon arrival. Identify cartons with your last name to assist the driver unloading at destination. I simply wanted to write a small comment so as to say thanks to you for all the lovely solutions you are posting at this site. My rather long internet research has now been rewarded with incredibly good strategies to go over with my colleagues. I would say that many of us site visitors are quite fortunate to be in a decent website with very many wonderful individuals with helpful basics. I feel very much privileged to have discovered your entire webpages and look forward to tons of more pleasurable minutes reading here. Thanks once again for everything. Thank you for the nice note, Kamilah! We appreciate it and hope you continue to visit our blog. My husband and i felt really glad when Raymond managed to carry out his homework from your ideas he grabbed from your web pages. It’s not at all simplistic just to possibly be giving out tactics which usually some other people may have been making money from. We really discover we now have the website owner to thank because of that. All of the illustrations you’ve made, the straightforward blog navigation, the friendships you aid to instill – it is everything excellent, and it’s really making our son in addition to us know that this concept is thrilling, and that’s especially fundamental. Thank you for the whole lot! Glad you enjoyed and that our blog was able to provide some assistance to you.